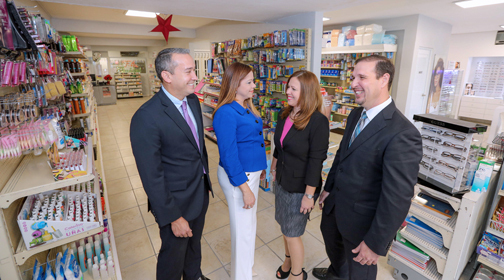 From left: FirstBank’s Ildefonso Rodríguez and Madeline Rodríguez, manager of the Guayama branch, and Pharmacist Yiovanna Almodóvar and Dr. Juan C. Segarra, owners of Optifarma. From left: FirstBank’s Ildefonso Rodríguez and Madeline Rodríguez, manager of the Guayama branch, Pharmacist Yiovanna Almodóvar and Dr. Juan C. Segarra, owners of Optifarma. FirstBank’s Small Business Unit granted two loans under the SBA Express and SBA 7(a) Programs to Optifarma, LLC for the purchase of inventory and operational capital, the bank announced. The amount of the loans were undisclosed. This family business recently opened its new location in Ponce, where if offers pharmacy and optical services under one roof to residents of the southwestern region of the island. The business’s innovative health care concept allows patients to have an eye exam and purchase their medications in a single visit. To this end, Optifarma has aisles of over-the-counter medications and consumer essentials, an optical room, a counter area where customers can choose their frames and lenses, and a waiting room. The locale also features parking spaces for customers. “At FirstBank we bet on the future of entrepreneurs, and that is why we support clients such as Pharmacist Yiovanna Almodóvar and Dr. Juan C. Segarra, two professionals and heads of families who decided to combine their professions under one roof for the benefit of their patients,” said Ildefonso Rodríguez, director of the Small Business Unit at FirstBank. The SBA Express Program awards financing of up to $350,000 for operational capital under lines of credit, or for everything needed to establish a business, remodel, or purchase equipment. The SBA 7(a) Program loans cover up to $5 million and the funds may be used for purchasing commercial property, refinancing commercial debts, improvements, and operational capital, among other uses. The SBA Express Program awards 50 percent of financing, while the 7(a) Program can guarantee between 75 percent and 85 percent, depending on the loan amount. I can’t say I trust any business loans at all. But the more I read about this SBA Express Program the more I wonder is this is really that great to cooperate with them. This ” lower monthly payment in comparison with a conventional business loan” sounds promising. I think I need to do more research on this matter, thank you for posting this article and giving me a push. Hey Buddy!, I found this information for you: "FirstBank grants financing to Optifarma". Here is the website link: https://newsismybusiness.com/firstbank-financing-optifarma/. Thank you.